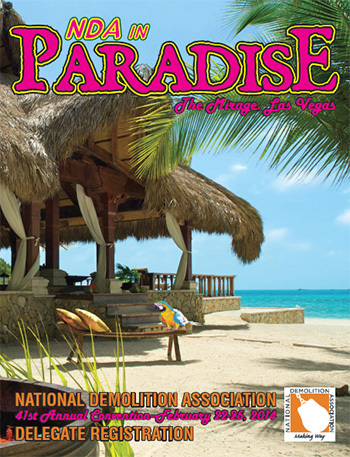 We look forward to seeing everyone at the National Demolition Association’s 41st Annual Convention — at The Mirage, Feb. 22-25. You can still register for the largest exposition of demolition equipment, products, and services in world by simply coming to The Mirage and visiting our Registration Area in the rotunda of the resort’s Exhibition Center. If you have any questions about the event or need additional information call 1-800-541-2412. Any hopes for a quick fix to Bertha were recently dashed when the Washington Department of Transportation announced it would take "months" to fully repair the giant tunnel boring machine. Building demolition demands a lot of heavy machinery to crush concrete and separate valuable materials for reuse. Often, those materials are transferred to offsite locations, which wastes time and resources. The process also wastes a lot of water in order to prevent harmful dust clouds from blooming. However, a Swedish student's concrete-eating robot aims to change all that. Savvy business owners typically expand their businesses by adding employees, making additional investments and creating new products or services. These additional steps to increase profitability also increase the complexity of their businesses — and for the owners, their personal financial planning. This complexity necessitates a team of advisors for assistance. This article discusses why a successful demolition business needs a team of knowledgeable and diverse advisors. California had the most buildings get the world's most recognized sustainable stamp of approval in 2013, but broken down by floor space and population, it's Illinois that landed on top. So says the U.S. Green Building Council in its ranking of the "Top 10 States for LEED" in the past year. In the '30s, St. Louis was struggling to revitalize its riverfront district. City leaders determined that the best course would be to build something iconic and set aside some $30 million for what they dubbed the "Jefferson Memorial." Twelve years later, the city had managed to create a very large gravel lot. The long-delay project became a competition to fill that space: The city solicited proposals from a broad array of firms and selected an audacious and iconoclastic design by Eero Saarinen. The Gateway Arch would embody the spirit of St. Louis while attracting new visitors and bringing a struggling neighborhood back to life. President Barack Obama recently called for a four-year, $302 billion transportation bill to replace the law that expires at the end of September, while repeating his pitch for tax reform to fill some of that gap. Reed Construction Data's U.S. chief economist Bernard Markstein answers one-on-one questions about the commercial building construction forecast.